Well, Polarik's back. And rather than just claiming that Obama is the love child of Malcolm X and a Lebanese woman, or pretending that every childhood photo of Obama was faked in Photoshop, now he's spinning a tale that puts himself directly in the story. The last time I posted about Polarik here (outside of a passing mention in a footnote in "Secret Origin, Part 2") was over a year ago, when he claimed PolitiFact invented a rumor about Obama's middle name. Now he's again trying to shift responsibility for something Birther-related, with a YouTube video and a WorldNetDaily article that claim the White House website linked to a fake Certification of Live Birth that Polarik created on his computer. On April 27, 2011. Obama and his White House held a press conference in which they gave reporters a copy of his "long-form" birth certificate and a copy of his "short-form" birth certificate." That copy, now posted on WHITEHOUSE.GOV, came from the image I created and stored in my Photobucket account - they did not make a copy of his short-form because there is no short-form (the COLB). 1) The White House blog linked to a black-and-white PDF scan of Obama's COLB that indicates that it was printed off the Snopes website, as it has a Snopes URL at the bottom. 2) An article on the Snopes website used to link to a COLB image in Polarik's Photobucket account. He goes on at length (as he is wont to do), but that's the core of his claim. The only problem is that even given that both of the above are true, that still doesn't support his conclusion that the White House published and/or circulated an imitation document he'd created. The White House printed off an image that was ON the Snopes server. The Snopes article linked to a Polarik image that was NOT on the Snopes server, but was rather on Photobucket's. The only way the White House published Polarik's image was if Snopes uploaded Polarik's image to its own server and published it at this address. And Polarik provides absolutely zero evidence to support that conclusion. Rather, much of his argument contradicts it. He shares some charts showing pageviews of his Photobucket account that came from Snopes. But if web surfers are arriving at his account, then they're not looking at an image uploaded to Snopes' server. After Polarik went public with this claim, several holes were pointed out in his story. The Snopes image has file info that says it was last modified "Saturday, November 15, 2008 3:19:50 PM." Polarik's fake COLB has file info that says it was last modified "Saturday, March 12, 2011 7:48:46 AM." Furthermore, the White House's image is clearly not Polarik's fake; there's a telltale uneven line of text at the bottom that clearly distinguishes the two. All too quickly, Ron's story was falling apart. Not only did Obama get a new birth certificate, the certificate itself was designed with him in mind as Rev. 10/08 - coincidentally, the date of Fukino's first press release (10/31/08). Hawaii ditched the old Certification of Live Birth and switched to a hybrid form called a “Certificate of Live Birth” - formerly the name of the long-form birth certificate. When Freepers realized that Polarik wasn't being quite honest with them, he did an about-turn and posted a disclaimer, where he said that he'd posted his fake image to test people to see if they could spot it. [ **UPDATE** Last year, I made a 2nd forgery with an obvious flaw in it (a tilted line) to see if people would notice it. They didn't. People are only seeing it now because the White House posted a black & white outline of my prior image (which does not have the flaw). 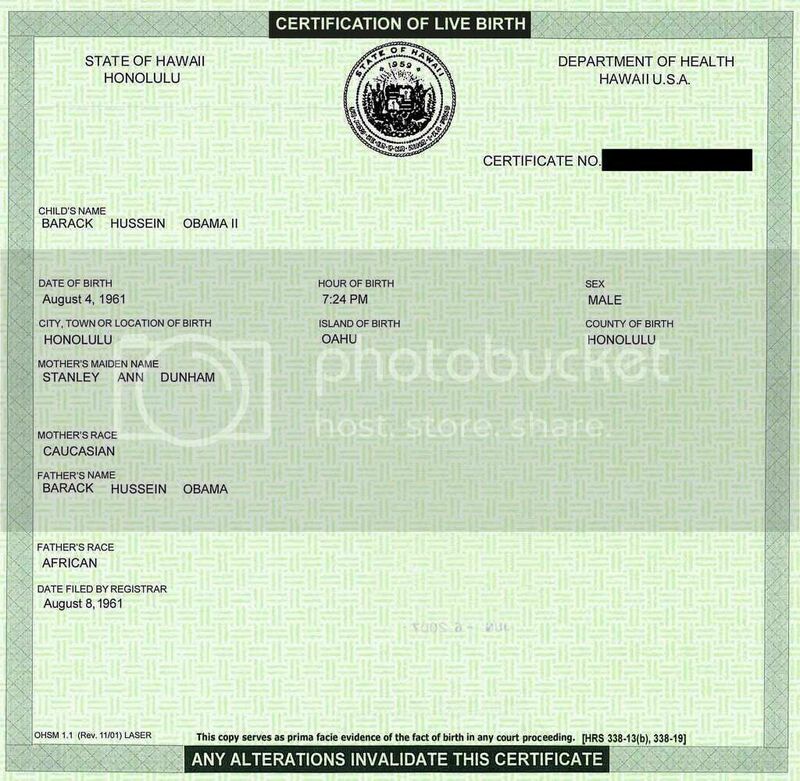 That outline was made from my image shown in the video, but I left the link alone so that viewers can see the flawed forgery that so many have called a genuine copy of Obama's birth certificate. You see? Sure, it looks like he was lying, but really he was just using a fake image to test people. Again. That Polarik created a fake COLB and posted it to his Photobucket account. That Snopes downloaded it and uploaded it to their server. That as a 'test', Polarik replaced his original fake with a crappier fake that had a tilted line. And that the White House printed out the original fake from Snopes and gave it to the press. So now we have TWO Polarik-created fakes, one which has a tilted line and one which he says exists but hasn't shown. Plus an inexplicable scheme to switch out a really good fake for a not-so-good fake to see if people noticed. And a claim that the White House published a fake he created, but not the same fake he originally claimed they published a few days ago. Still, even as silly as that sounds, is it believable? No. In trying to salvage his story, he simply made it worse. For starters, one can view Polarik's Photobucket RSS feed to see when images were uploaded. "BO_Birth_Certificate.jpg" was indeed uploaded on March 12, 2011. Rather curiously, images called "Barack Obama's birth certificate (Factcheck copy)" and "Barack Obama's birth certificate (Fight The Smears copy)" were also uploaded the day before on March 11...and they're the same fakes with the tilted line. 'Test' or not, he was certainly out to lie to people about what his uploads represented. This upload date demonstrates one of the problems with Polarik's new timeline. He uploaded the tilted line fake on March 12, but the White House printout was made on April 25, 2011. Yet the White House image is clearly not the March 12 fake. In fact, Polarik's version 2.0 story is maddeningly irrational; if Snopes had already linked to a fake he created, then why replace it with a more obvious fake? And why, when you go public, do you only brag about Snopes linking to the obvious fake, and not mention the 'prior image' at all until you revise your story? The feed doesn't show when the original "BO_Birth_Certificate.jpg" was uploaded to Polarik's Photobucket account, but there was indeed a prior image at that URL. However, it wasn't a fake; it was the real thing. Israel Insider linked to it way back on June 24, 2008. Polarik certainly hadn't created a polished fake within two weeks of the original release of the COLB. He simply uploaded the real image, using the same filename that the DailyKos had used. Then in March 2011, for some reason, he replaced it with an imitation. See there? 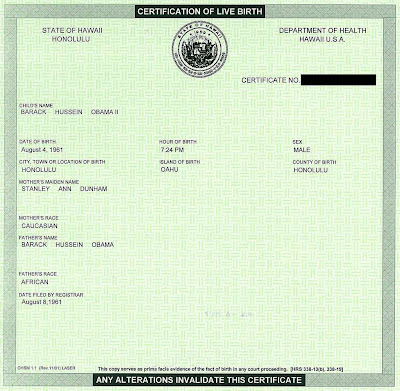 "BO_Birth_Certificate.jpg," which I saved July 20, 2009. Followed by several other Polarik-created COLB files which I saved contemporaneously while I was writing about Polarik. 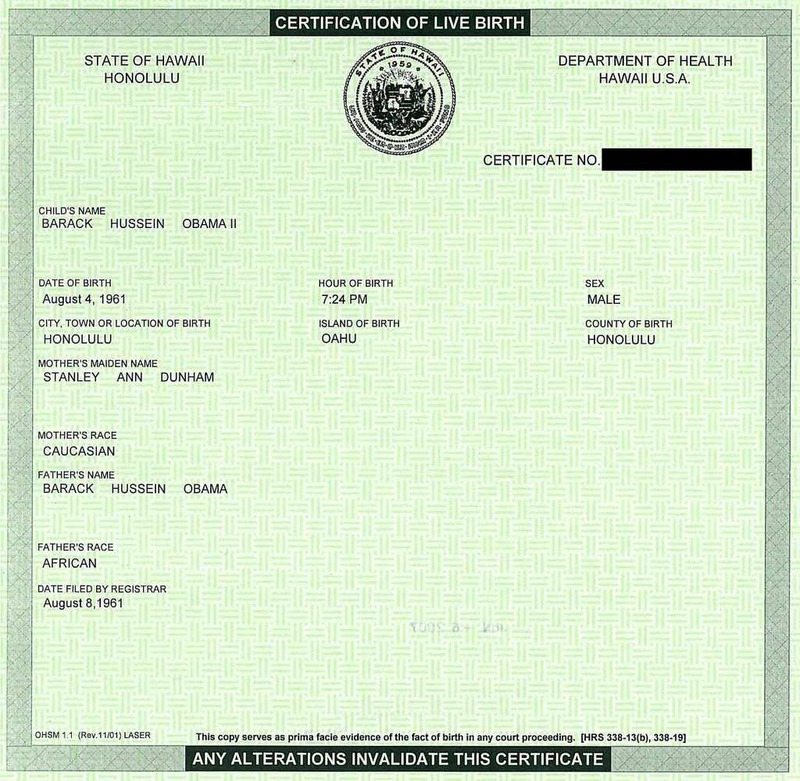 And what does BO_Birth_Certificate.jpg look like? Yep. It's just the plain ol' real COLB. If you open it in a separate window from the tilted line fake, you can see the differences for yourself. This isn't merely a shifting of a line; the entire rattan background changes, as does the border. So, long story short, what do we have here? Snopes may have linked to a once-legitimate image URL on Polarik's Photobucket account, which Polarik originally uploaded in June 2008 but surreptitiously swapped out for an imitation image in March 2011. (This is a reminder of the risks of hotlinking to outside sites.) The White House printed out a legitimate image that was saved to the Snopes server, said image having nothing at all to do with Polarik's March 2011 fake. There's no evidence whatsoever of Polarik's 'prior' fake that was first mentioned in his revised story. Polarik's first attempt at his story may have gotten published at WND, but its faults caused him to revise it, but the narrative still crumbles under basic scrutiny. One of the great legends of Birtherdom, particularly over at FreeRepublic, is a story spun by Jim "RaceBannon" Bancroft. Bancroft was calling Obama's birth certificate a forgery within ten minutes after it went online, so it's no surprise that he went on to be a vocal Birther. What sets him apart is that he's a Birther with a tall tale. Although he was preaching the 'Born in Kenya' gospel in the summer of 2008, it wasn't until November 2009, over a year after the Presidential election, that Bancroft made a stunning announcement: he had met teenage Obama in a Hawaii shop in 1980, and teenage Obama had personally told him that he was born in Kenya. Indeed, according to Bancroft, teenage Obama told him that he was born specifically in Mombasa. And that he was from mixed-race parentage. And that he grew up in Indonesia. And that he wanted to be President when he grew up. In subsequent tellings, teenage Obama's confessional to Bancroft grew even more thorough, with the young man also saying that he was living in Hawaii with people who weren't his parents and stating that the old black cook in the shop was his father. Oh, and when he finally decided to share his story with the world on November 16, 2009, where did Bancroft first publish it? At Alan Peters' Anti-Mullah. Yes, at the blog of the same man who began the 'Born in Kenya' rumor the year before. Indeed, Bancroft and Peters have been affiliated with each other since at least 2005. They've even appeared on the radio together. Still, it wasn't the details of Bancroft's Obama story that impelled this post. Nor was it his friendship with Alan Peters. Nor was it his fanciful claim of having named the Tamil Tigers. I met the son of G. Gordon Liddy on board the USS Okinawa in 1980 when we were heading to Iran. Sounds plausible enough, right? Certainly more plausible than a random encounter with a teenage Obama who spilled his entire life story and personal secrets to a random stranger. I'd always written the Liddy story off as a perfunctory detail in the story, an attempt to disguise the piece's Birther motivations. Except the Liddy story is undeniably false, it is provably so. James G. Liddy is a former Navy SEAL and the son of G. Gordon Liddy. How do we know that James Bancroft absolutely did not meet him in the summer of 1980? 1) Jim Liddy was 20 in 1980, not 28. 2) Jim Liddy was not on the USS Okinawa in 1980. 3) Jim Liddy was not a Lieutenant in 1980. 4) Jim Liddy was not a Navy SEAL in 1980. 5) In fact, Jim Liddy did not even join the U.S. Navy until 1985. Yet Bancroft quotes the young man as confirming a familial relationship and says that "the likeness was now apparent and unmistakable." Basically, the entire story is utter crap from top to bottom. The first of these discrepancies was brought to Bancroft's attention within a matter of days. His reaction was to stand by his supposed memories, but claim the officer lied to him about being the son of a convicted felon. While on ship, I met the son of a famous political figure connected to the Watergate scandal on board the USS Okinawa in 1980 when we were heading to Iran....I saw this person’s name written on his trousers, the same name as that political figure. This political figure was the chief of certain operations in the Nixon White House....So, I find myself standing next to a 6’2″ man about 28 or so with the name on his trousers, and I asked him, “Hey, are you related to that man” His answer surprised me totally, “Uh, Yes, he’s my father”. The likeness was now apparent and unmistakable and since then, I have read how one of his sons was in the military at that time, so, that is who I met. He simply removed all the references to the name "Liddy." The entire description of the event remains the same. His claim that he met the son of a convicted Nixon conspirator remains the same. Even the "apparent and unmistakable" family resemblance is still there. Bancroft had already learned that his story of meeting Liddy's son could not possibly be true, but his response wasn't to cut the anecdote or even to rewrite it to propose he had been the target of a joke. No, he left the anecdote in, continued to treat it as factual, and simply scrubbed it of all the specific references that could be used to show it was an impossible event. He continued to tell the story, even as he knew it was completely false. In short, Bancroft's story spotlighted two supposed celebrity encounters in 1980. One (Obama) with absolutely zero confirmable details, and another (Liddy) that was capable of independent confirmation. And the one that was capable of independent confirmation was independently, and conclusively, debunked. Moreover, Bancroft's response to the debunking was not to drop the anecdote; it was to scrub the anecdote of the specific details that made such a debunking possible. And amazingly, other FreeRepublic Birthers continue to promote Bancroft's personal myth on the grounds that he is a "credible" source.